This is our custom-built Gold "Silent" TS to Gold TS Canare GS-6 Unbalanced Line Cable or Guitar and Instrument cable (TS is 1/4" mono or unbalanced connector). The Gold TS Silent is a special version of a TS plug with integrated switch which automatically mutes (shorts) a guitar cable to avoid annoying pops and squeals when hot swapping guitars. Construction is Neutrik gold TS connectors with Canare GS-6 cable. Neutrik connectors are some of the best connectors around. 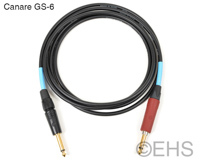 Canare GS-6 cable is very flexible, durable, heavy-weight cable with a 92% coverage braided shield and carbon sleeve. Photo 1 shows 6' cable. Photo 2 shows the two ends with straight connectors.